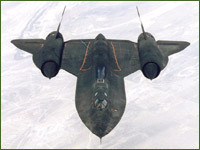 StronglyTyped.com recently posted "Tales From Above", a collection of interesting short flying stories. Below is the one I enjoyed the most. You can read them all at StronglyTyped.com. I'll always remember a certain radio exchange that occurred one day as Walt (my backseater) and I were screaming across Southern California 13 miles high. We were monitoring various radio transmissions from other aircraft as we entered Los Angeles airspace. Though they didn't really control us, they did monitor our movement cross their scope. I heard a Cessna ask for a readout of its groundspeed. "90 knots" Center replied. Moments later, a Twin Beech required the same. "120 knots" Center answered. We weren't the only ones proud of our groundspeed that day as almost instantly an F-18 smugly transmitted, "Ah, Center, Dusty 52 requests groundspeed readout." There was a slight pause, then the response, "525knots on the ground, Dusty". Another silent pause. As I was thinking to myself how ripe a situation this was, I heard a familiar click of a radio transmission coming from my backseater. It was at that precise moment I realized Walt and I had become a real crew, for we were both thinking in unison. "Center, Aspen 20, you got a groundspeed readout for us?" There was a longer than normal pause. "Aspen, I show 1,742 knots" No further inquiries were heard on that frequency. It won't be long until you're showing off like this! 8) I cannot wait to hear all about your night flight tonight. Whoohoo!